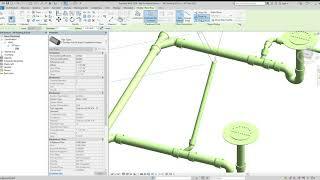 The Bloom tool starts the 3D drafting process. Simply run the tool and click on any item with MEP connectors, and watch as every connector automatically has a small stub drawn straight out. This tool is best used on equipment or fixtures to start the 3D drafting process. Next, there are 4 elbow commands. Each of these allows the user to draw a turn in a specific direction while staying in a 3D view. No more confusing hovering or dragging in a direction hoping the Autodesk® Revit® UI can tell which direction you want to bend. Simple turn up, turn right and be on your way. The mo-co and mo-co-al commands stand for move connect and move connect align. These two tools will move objects in your model into the position necessary to make a connection and then make the logical connection. Use it to connect branch ductwork to its new VAV box location, or to connect a sanitary line to a water closet or lavatory. You choose whether the moving object should also be aligned to the connector when it is moved. Flip multiple solves the simple problem of flipping the work plane of multiple objects at once. Works great with objects that are frequently hosted like outlets, lights, and air terminals. Sum parameters provide instant feedback about your design by summing parameters on any selected objects. The tool will look at all parameters on the objects that are selected, find out which parameters all objects have in common, and then display the sum of those values. No user input, just results. ParaPusher works to add parameters to your Revit families with as little configuration as possible. Often companies have standard schedules they would like to use with a wide variety of families, especially families from vendors. If your family appears in a schedule that has your parameter then you're just a few clicks away from the family working perfectly. From within the schedule simply run ParaPusher, choose the parameters, type or instance, and group, then select the families you want to change. Click accept and ParaPusher will automatically open the families, add the parameters as specified, and then load the family back into the project. You even have the option to save the families during the modification. You may need to restart the Autodesk product to activate the app/plug-in. You will be asked to enter an email address to register the product. This is a free registration. Note: if the tools aren't activated, try restarting Revit again. Email revittoolkit@microdesk.com for assistance. This email is written in the footer of the About command dialog inside the toolkit. Multiple Revit Versions, fix some user reported bugs.